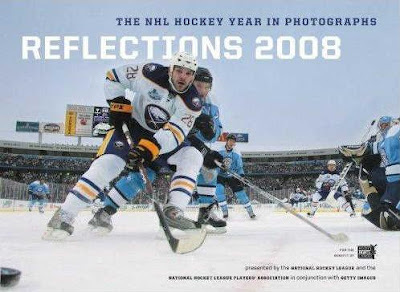 Reflections 2008: The NHL Hockey Year in Photographs gathers together the highlights of a year’s worth of hockey memories, offering a spectacular pictorial chronicle of the 2007–08 NHL season. With this photographic yearbook, fans will relive the season by poring over images of Sidney Crosby, Nicklas Lidstrom, Jarome Iginla, Vincent Lecavalier, Martin Brodeur, Roberto Luongo, Mats Sundin, and many other stars of the NHLl. They’ll recall the great outdoor game where snow fell quietly as the “boys of winter” played before seventy thousand fans. From the first drop of the puck to the hoisting of the Stanley Cup, it’s all here. 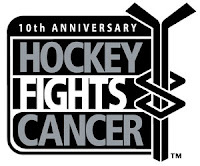 The National Hockey League and the NHL Players’ Association are proud supporters of Hockey Fights Cancer, and a share of proceeds from the sale of this book will be donated to the cause. Joe's Comment: Folks, I got a quick look at this book at the book store today. Amazing photography. And the best part is some of the proceeds goes to a great cause.